Double, double toil and trouble… Halloween is on its way. Here are 16 ways to have a Spooktacular time in the Sullivan Catskills. Come in costume, sing along, do the time warp again – LIVE at the Forestburgh Playhouse! In this cult classic, sweethearts Brad and Janet stuck with a flat tire during a storm, discover the eerie mansion of Dr. Frank-N-Furter, a transvestite scientist. As their innocence is lost, Brad and Janet meet a houseful of wild characters, including a rocking biker and a creepy butler. Through elaborate dances and rock songs, Frank-N-Furter unveils his latest creation: a muscular man named “Rocky.” Tickets sell out fast – reserve now. Experience Fort Delaware, our local living history museum, after dark for the Haunted History Lantern Tour. After the tour, gather around a bonfire while traditional Irish music fills the air. Hotdogs, chili, donuts, and cider will be available for purchase. 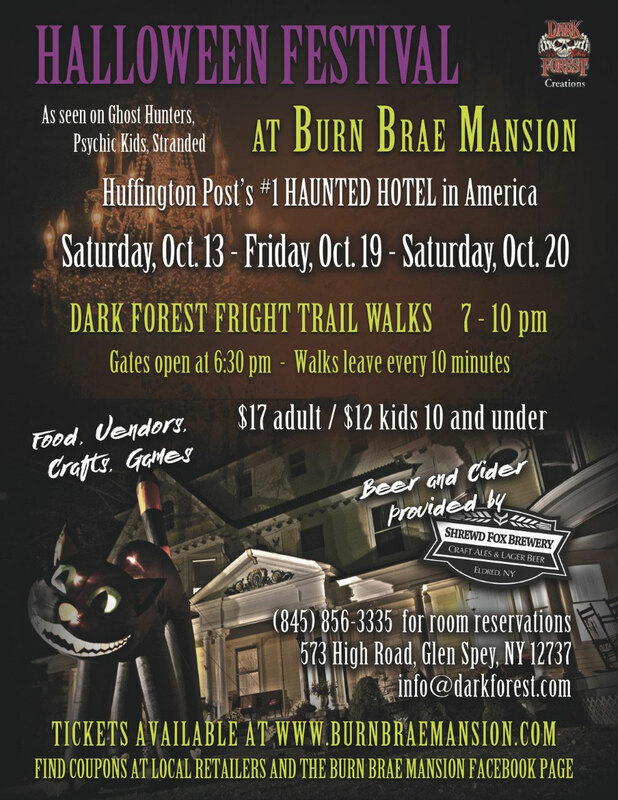 Part of New York’s Haunted History Trail, Burn Brae Mansion welcomes all to their Halloween Festival and Dark Forest Fright Walk. Enjoy beer and cider from Shrewd Fox Brewery; shop for food, crafts, and Halloween items too. Please note, the Fright Walk is not recommended for small children and does require trail walking. Three floors of frights await you at the historic Rivoli’s Haunted Theatre Tour. Every year it gets bigger, better, more ghostly, ghastly, eerie and spine-tingling. Bring a friend or two, because going it alone is definitely not the best idea… Not recommended for children under the age of 13. Capture the energy of the season at Crystal Connection Center’s Halloween Healing Psychic Fair. Choose from energy healing, mini Vogel crystal sessions, tarot and aura photography, intuitive readings, palm readings and much more. Walk-ins are welcome but appointments are strongly suggested. For a special treat, make your way to The Museum at Bethel Woods Center for the Arts. Relax in their comfy theater seats and watch a Halloween favorite… For the adults, Young Frankenstein will be playing. Come in costume for your chance to win a prize, sing along to your favorite songs and participate in some fun trivia. The café and lobby will be open beforehand for film-inspired meals and “Frau Blucher” cocktails. For the kids, Monsters Inc. means awesome family fun! The Museum will be alive with games, activities, contest, and crafts. Participate in the family costume contest for a chance to win prizes and show off your best moves during their Monster Mash Dance Party. Register for the festivities today. Take a relaxing ride in the hay wagon or get lost in the corn maze. Find a treasure in the Lost Irishman’s Mine and hunt for the perfect pumpkin in the pumpkin patch at Cunningham Family Farms. Then, let the wee ones tire themselves out in the barnyard play area and obstacle course. Fresh air and family fun – guaranteed. Do something different – throw on your costume, grab family and friends and partake in the fun-filled Monster Dash 5k celebrating Halloween and community spirit. Runners and walkers of all levels are welcome to participate. If you’re looking for a place to flaunt your favorite costume and win a prize, look no further… Holiday Mountain will host their Costume Party on Friday, October 19th. On Saturday, October 27th, choose between the Halloween Party at Catskill Distilling Co. with Nilko Andreas and Lamar NYC or head to Cab Frankenstein’s Monster Mash for Paprika’s return. On October 20th, take the gang to the Town of Bethel Park for a family day filled of Halloween fun. Start the festivities with the Trunk-o-Treat, enter the Pie Baking Contest and let the kids march in the Costume Parade. Experience the Haunted Trail, participate in games, and activities too. On October 27th, lineup in front of the Government Center in Monticello for the Halloween Parade. Afterward, meet at the Ted Stroebel building for fun games, food, and activities. Looking for more Halloween Festivities? Stay up to date with all the happenings in the Sullivan Catskills… Our Facebook events are updated daily. Every Wednesday, we send out an eblast highlighting events for the weekend and beyond – subscribe today!